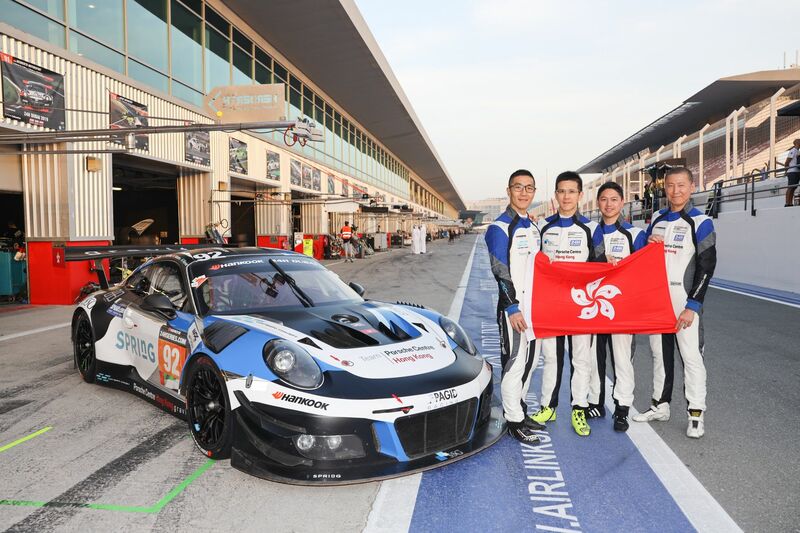 The Hong Kong Racing Team’s continued high rankings in 2017 and 2018 gained them sponsorship from Porsche for the Dubai 24 Hour race, which ran from January 10-12 this year. The team is made up of four FIA Bronze-rated “gentleman” drivers—Antares Au, Jonathan Hui, Kevin Tse and Frank Yu. Each of the team members are dedicated to their own field of work, yet they have accumulated extensive racing experience in both regional and international events over the past decade. “We are extremely honoured to represent HKSAR again at this prestigious event, and thank our partners at Porsche Centre Hong Kong for supporting our all-gentlemen effort” says Frank Yu, who brought this line-up of drivers together in 2016. The annual Dubai 24 Hour is a major racing event that hosts around 400 drivers from around the world. The Hong Kong Racing Team placed third in the GT4 category in both 2017 and 2018, sparking their decision to up their competition by entering the GT3 category. The competition in GT3 category is fierce—on average, the GT3 drives 10 seconds quicker per lap than the GT4. Despite not bringing in a win, the Hong Kong Racing Team certainly brought their A-Game, piloting a 2018 spec 911 GT3 R, which was similar to the car that won the 2017 Dubai 24 Hour race. The Hong Kong Racing Team’s continued success is considered unusual for such a recognised global event, as the majority of entries are from either semi-professional or professional contestants. The Hong Kong Racing Team attribute a large part of this to the continued improvement of their team dynamics now that they have done a number of races together. For property investor Jonathan Hui, it's all about the process rather than the end goal. "When you're young, you just think about winning,” he says. “This will distract you from the enjoyment of driving. The most important thing is to never forget to enjoy the process of whatever you're doing." Architect Frank Yu says, "To win, you first need to finish. Being the fastest doesn't mean you will win, be calm and just do the best you can." Frank Yu Founding partner of Gravity Partnership; member of the court of Lingnan University.